Living with tooth loss can be a real burden. Not only was your confidence lost along with the tooth, but your ability to chew many of your favorite foods and being able to speak clearly. The complications of tooth loss also extend further than you might be aware. When they are not replaced, they will negatively impact your oral health. In fact, you develop an increased risk for tooth decay, gum disease, and additional tooth loss in the future. To restore your quality of life and your oral health, you can replace your missing teeth with dental implants in Sugar Land. Dental implants have become the most preferred and reliable option to treat tooth loss because they offer over a 95% 10-year success rate. They are far different than any other type of dental prosthetic because they not only replace the crown, but the root as well. With an implant post surgically placed into your jawbone, it stimulates new bone growth to protect the density of your jaw. This allows it to fuse to your bone to create a secure and stable foundation for the dental crown, which is attached by an abutment. Due to the materials and process used to replace the tooth, it will closely look and function naturally. 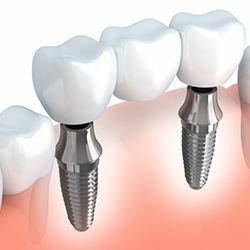 No matter if you are missing one tooth or all your teeth, your dentist in Sugar Land offers the solution you need with dental implants. Single Tooth: To fill the space of a single missing tooth, an implant post is surgically placed into your jawbone. An abutment is then attached to connect a custom-made dental crown. Implant Retained Bridges: When several teeth are missing in a row, an average of one to two implant posts are used to anchor a row of prosthetic teeth to your jawbone. This is the perfect alternative to a traditional bridge and crowns. Implant Retained Dentures: An entire arch of teeth can be replaced using implant posts to hold the denture in place. You will never have to worry about any slipping or irritation while benefiting from an increased biting force of over 70% when compared to traditional dentures. Mini Dental Implants: If your jawbone’s density has been compromised, you do not need bone grafting with mini dental implants. They are smaller than traditional posts, allowing you to restore your smile without an additional surgery. All-on-4: You can get teeth in one day using the All-on-4 method. 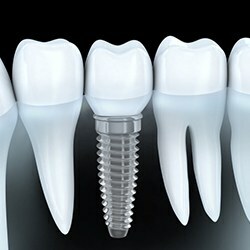 4 implant posts are placed into your jawbone to attach a custom-made denture. If you are ready to replace your missing teeth, we can help. We will perform the consultation you need to ensure that you are a candidate for the procedure. With a customized treatment plan, we will rebuild your smile to improve your quality of life. Stop living with the complications of tooth loss. 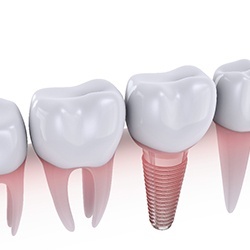 Contact our office today to see if dental implants are the right option for you.